In case you’d missed it, Ousmane Dembele has scored for Barcelona against Chelsea to make it 2-0 at half time of tonight’s Champions League clash. The France international has put a frustrating first season at the Nou Camp behind him with a superb effort to give Barca a major advantage in tonight’s last-16 game. This did not go unnoticed by one of his old team-mates – Arsenal striker Pierre-Emerick Aubameyang. The Gabonese forward left Borussia Dortmund for Arsenal this January, just a few months after Dembele left Dortmund to join Barcelona. This follows recent transfer speculation that Aubameyang wants Dembele to join him at the Emirates Stadium after his tricky start at Barcelona. 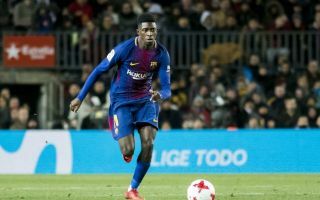 Don Balon reported this last month, and it follows a season in which the 20-year-old has not always been a regular starter and has occasionally looked unsuited to Ernesto Valverde’s side. Ramène le à Arsenal gars ??? ?